The New York Constitution mandates that a question be placed on the ballot every 20 years asking New Yorkers whether they want to call a state constitutional convention. On Nov. 7, this question will be on the ballot. If voters support calling a convention, their next steps are to elect delegates to the convention and then vote up or down any constitutional amendments proposed by the convention. Fourteen states have similar periodic referendums. As I describe in a recent journal article, government employee unions, especially teacher unions, have in recent decades led the opposition to a “yes” vote, in terms of both organization and money. 59 percent of Americans favor shifting current public employees from guaranteed pensions to 401(k)-style accounts. 72 percent of Americans are concerned their state and local governments may not be able to fund currently promised public employee pensions. 76 percent of Americans say pension reform should be a priority. 77 percent of Americans oppose reducing spending on services, like education, health care, so that public employee benefits could be paid at current levels. Given these poll numbers, unions spending millions of dollars to protect billions of dollars is a no-brainer. Unfortunately, unions’ presentation of their concerns to the public has been grossly misleading. As with any politically sophisticated special interest group pursuing an unpopular agenda, the unions have tried to exercise their influence in the shadows while framing their opposition in terms of popular causes and groups. With both convention proponents and opponents avoiding the pension issue – albeit each for different reasons – no state in recent decades has included a thoughtful debate about public pension policy as part of the larger conversation on whether to call a convention. But if unions have good reason to believe that a convention would debate pensions – and I believe they do – then the public deserves to have that debate prior to voting for a convention on the November ballot. Why are government unions so concerned about preserving their pension protections? Is the public’s pension envy reasonable? How do private and government pension benefits compare? Why do government pension benefits have better protections than private pensions? Is it either efficient or just that only a small fraction of government employees – those who become fully vested after decades of work – receive the lion’s share of pension benefits? Is the principle of equal pay for equal work violated by the growth of tiered pensions, where there is a permanent pension benefits gap between new and old hires that perform the same work? If the public is ill-informed about pension benefits, how does accurate information affect their views? Why has New York’s contribution to its Employees Retirement System skyrocketed from 1 percent of payroll in 2000 to 20 percent of payroll in 2015? How are pension obligations crowding out funding for other government programs such as education, healthcare, and other social welfare programs? Why have unfunded pension liabilities reached $1.2 trillion nationally and $56 billion in New York City alone? Do unfunded pension liabilities violate the rights of future generations who cannot vote? The periodic constitutional convention referendum was designed as an institutional mechanism – the only such mechanism in New York state – to allow the people to bypass a Legislature that either won’t reform itself or is unduly influenced by special interests. In the coming months, government unions will spend millions of dollars promoting the argument that a convention won’t function as intended. But perhaps the unions’ true fear is that it will function as intended – at least regarding the big-dollar issue driving their opposition: preserving the unpopular status quo on government pensions. Source: Snider, J.H., Pension Issue Surreptitiously Drives New York ConCon Politics, City & State, July 12, 2017. 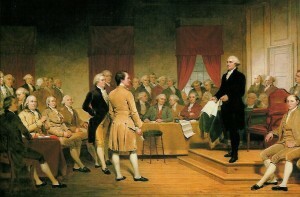 For a contrary view by two former iSolon board members (iSolon edits The State Constitutional Convention Clearinghouse and The New York State Constitutional Convention Clearinghouse), see Galie, Peter and Christopher Bopst, When Rhetoric Attempts to Trump Reality: Why A Constitutional Convention Would Not Take Away Public Employee Rights, Rockefeller Institute Blog, August 9, 2017. First, they assert that under federal law it is illegal to “retroactively reduce benefits to retirees or to adjust accrued benefits to current employees.” But many states have retroactively increased benefits to retirees and current employees. Why is it legal under the U.S. constitution and federal law more generally to increase but not decrease contractual benefits? Second, they do not discuss federal bankruptcy law, which provides a mechanism to override contract law. The interpretation of this vague law is still not settled when local government units go bankrupt. Practically, it becomes a question of not whether but what contracts will be broken and to what extent bondholders vs. pension recipients (and various subcategories within those larger categories) will be the losers. When government contracts are written in an inconsistent manner, it may also be impossible to know which will be honored until there is a lawsuit to answer the question. Third, the case of New York City pensions is not discussed. 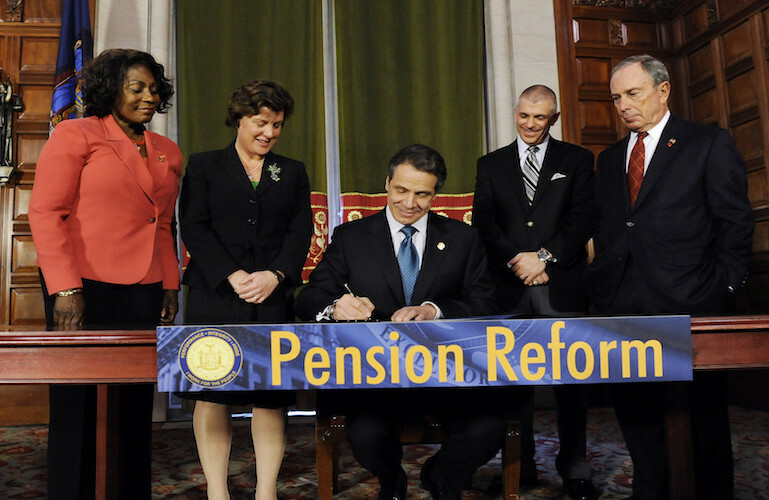 New York City pensions are in much worse financial shape than New York State pensions. Indeed, they have among the largest unfunded liabilities of any government in the United States. Fourth, they rely on government estimates for their estimates of unfunded pension liabilities. But government estimates are widely considered to have overly optimistic assumptions about the future. Fifth, they don’t consider polls when citizens are asked to make tradeoffs between paying pension obligations and paying higher taxes or receiving substantial cuts in vital public services such as schools, libraries, health, and transportation. Poll results tend to be very different when framed in this way. If the pension issue became a politically salient issue after a convention were called, the tradeoff framing would most likely generate a more reliable electoral prediction. Sixth, they don’t explain why public union leaders have privately been very worried about the public’s pension envy. The unions have excellent polling operations for internal use, and it is unimaginable to me that they haven’t polled the public on this question. It’s my judgment that union leaders don’t shoot from the hip; they have outstanding political smarts based on excellent research. Seventh, assuming arguendo that their argument is sound that a convention wouldn’t ultimately propose an amendment restricting pension rights, they don’t address the possibility that a convention might publicly debate such a proposal. Currently, public pension envy, including the reasons for it, is one of the many taboo topics that legislators of both major political parties don’t find it in their political interest to discuss. But conventions excel at discussing issues that powerful special interests don’t want a legislature to discuss publicly. That is partly because most delegates won’t face a re-election battle (e.g., delegates are limited to one-term as a delegate), as convention accountability comes through a popular referendum on whatever amendments are proposed. Special interests fear such a public discussion because they know it might get out of control and change public opinion at not only the state but also local government level where many of the same issues are on the bargaining table. Gelinas, Nicole, The Constitution can’t protect underfunded public pensions, New York Post, November 12, 2017. Hill, John, Federal appeals court upholds pension changes in Cranston, Providence Journal, January 23, 2018.